A must-read for everyone who is fed up with the reign of corporate super-citizens in American politics. – Justice (Ret.) James Nelson, Montana Supreme Court. 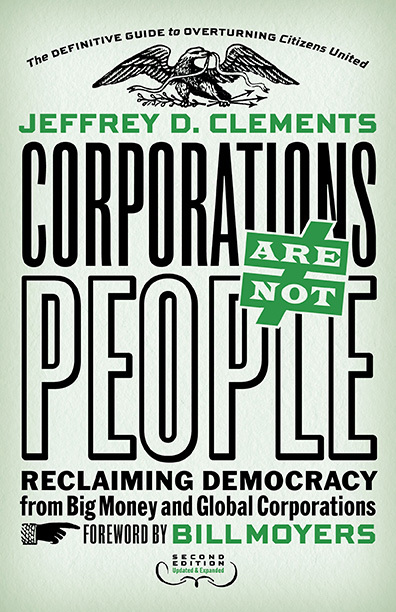 In Corporations Are Not People: Reclaiming Democracy From Big Money & Global Corporations, Jeff Clements describes how the Supreme Court in Citizens United v. FEC and related cases has fabricated unprecedented rights and power for corporations and money, at the expense of human beings and democracy itself. Now, five years after Citizens United, this new, updated edition shows how Americans are coming together to overturn the decision and renew the promise of freedom and democracy for people everywhere. If you want to know how to save our democracy, you must read this book. Clements tells how the logic of “corporate personhood” has allowed corporations to trump the rights of people. In vivid stories he recounts the real consequences of that tortured logic. Best of all, he paints a compelling picture of what “we the people” can do to win back our democracy. The new Corporations Are Not People is for everyone who seeks to join the historic work to overcome partisan divides and re-engage in self-government by all Americans — community by community, state by state, and, ultimately, in Washington itself. This new edition is updated throughout with surprising information and analysis about the impacts of unlimited money in federal, state, and even local elections; the spreading “corporate capture of the courts” resulting from the dangerous fabrication of “corporate rights” in the Constitution; and the growing, historic response from people of all political viewpoints to defend democracy and rebuild government of the people. A completely new chapter—“Do Something”- shows how thousands of so-called ordinary people are working to build the “most dynamic, grass-roots movement in the United States,” and offers portals for people to connect and act. 100% of author royalties are donated to non-partisan organizations working to renew democracy and government of the people. Corporations Are Not People is at your local independent bookstore, Amazon , Barnes & Noble, the publisher, Berrett-Koehler, or wherever books are sold. I heard you speak on Minnesota Public Radio from Western Wisconsin tonight. I hope you speak every day if you can. You are very motivating! Thank you for your message on Minnesota Public Radio. Please visit Wisconsin. Please print only my second message regarding Wisconsin. Thank you. I enjoyed reading your article in the Arizona State Bar magazine this month. When we finally have the sense to simplify our tax code and go to a pure flat tax which eliminates archaic and arcane deductions, exemptions, etc…so that our most vital resource, i.e. human productivity, can be used for truly important global endeavors such as climate control, pure water and air, etc…will the “corporations” who take advantage of their label as “persons” gladly participate by paying a reasonable percentage of their gross revenues as the common man must pay?